Thinking of studying abroad alone? Don’t have a friend to come along with you? No problem! In fact, that’s great! 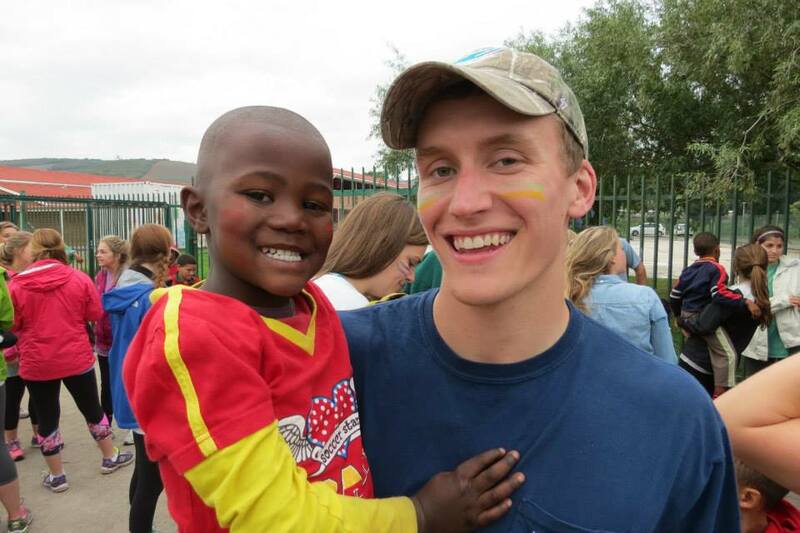 Read this guest post by our very own Community Leader, Zach Pursley, to hear what he has to stay about his experience coming with us to Cape Town this summer all by himself. “You heard it from your mom. You heard it from your dad. You heard it from every teacher you had in elementary school. You heard it from everybody growing up. “Don’t talk to strangers!” If you know me at all, which you don’t because I haven’t written anything for you before, but take my word, you know I like to question things. I don’t like to accept things as they are without first asking myself questions or possibly challenging the norm. After all, normal is boring. Quick fact about me: I am an adamant lover of funny movies. My favorite comedy is 21 Jump Street. The reason I bring that up is because Dave Franco’s character, Eric Molson, speaks up when he confronts someone who says they don’t like strangers. He says, “How do you ever expect to make any new friends with that kind of attitude? It’s like, everyone’s a stranger until you give them a chance, man.” Take that, parents! You were wrong! All jokes aside, that is the attitude that I took upon signing up for LEAD Cape Town last summer. I didn’t know anybody going on the trip. Well, that’s not entirely true. I knew of three people but had never talked to them or never developed a friendship with them. When I signed up, my first thought was fear. I was flooded with fears that I had thought had long left me. “What if nobody likes me?” “What if I don’t fit in?” “I’ll be so shy around these people.” “What if I lose control of all bodily functions and have another accident? !” Okay, that last one was a little fabricated. Okay, it was completely fabricated. The point is that I was a little worried about not knowing anybody. I tried reaching out to all of my community group members to introduce myself on Facebook, but none of them responded to me. In their defense, my profile picture at the time was a picture of Chemistry Cat because, well, I am a complete nerd. However, I don’t blame them for not responding. So, May 24th arrived, and it was time to begin this life changing journey all on my own. My parents dropped me off at the airport, and I boarded an airplane to Washington D.C. It wasn’t long before I met other Global LEADers on the plane. In fact, they were all from the Nashville area like me. When we landed in D.C., we were greeted by even more Global LEADers, mostly girls and just 5 guys, including myself. During our multi-hour layover, we all made it through that awkward phase of every relationship where you don’t quite know anybody, but you’re spending time with each other. The time did us good. Before our flight left for Johannesburg, we had all become good acquaintances considering we had just known each other for a few hours. Once we finally arrived at our final destination of Cape Town, we met up with the other 7 guys and a few more girls who had taken separate flights and had beaten us there. Finally, the 21 hours of travel had brought me to Cape Town, South Africa with 11 other guys and 94 girls, totaling 106 people, none of which I was friends with before leaving my house the previous morning. From that point forward, it was extremely easy making friends. All of my worries and fears were left behind in the United States. I realized that most of these people were going through the exact same thing: they didn’t know anybody either. They the easiest way to make friends is to experience something traumatic together. Traumatic isn’t the first word I would use to describe studying abroad, but you get my point. For the next five weeks, we would go to class together, eat together, live in the same apartments together, party together, laugh together, and live life to the absolute fullest together. We jumped off bridges together, swam with sharks together, experienced African safaris together, rode elephants together, climbed through caves together, pet cheetahs and tigers together, and help serve the less fortunate together. That summer, we were all transformed together and grew because of the experiences we shared with each other. I began the trip knowing nobody and left with several new best friends. In the summer of 2014 in Cape Town, South Africa, my life changed forever, and it’s all because I decided to talk to strangers. We’re so grateful that people like Zach had the courage to come on our trip alone. Living 10,000 miles away for 5 weeks without a friend from home might sound crazy, but let us assure you, traveling alone is the furthest thing from lonely. The Global LEAD family is composed of like-minded students and staff who are down-to-earth, genuine, and confident, and will make you feel right at home as soon as you step foot in the airport. Thanks for the being the guest post of the week, Zach! For those of you who are coming with us abroad without a friend this summer — you’re going to leave with more friends than you can count. Thomas Jefferson even said, “One travels more usefully when alone, because he reflects more.” You’re going to be just fine. More power to you!